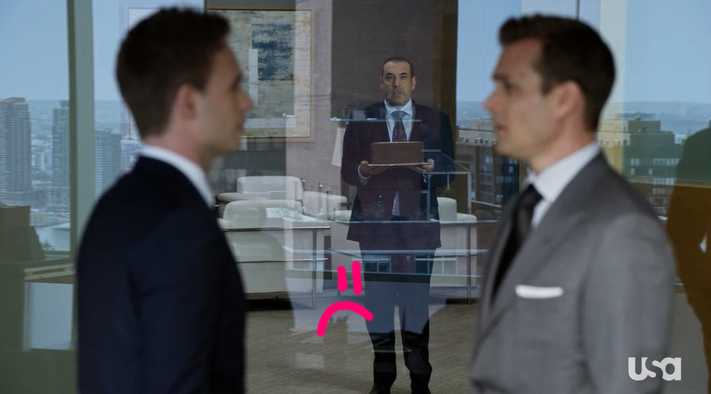 Last night’s episode of Suits…AH-mazing as always. There is so much drama to deal with this season, it’s hard to focus on what really matters-solving the case. I love you Michelle Fairley, but really could care less about your case when there’s drama between Harvey/Mike and now Donna and Rachel!? To sum things up, Harvey discovers Ava’s second in command rats her out on the bribery charges. Harvey knows how to play on people’s emotions, and advises Nick to think things through before he betrays his longtime mentor Ava. 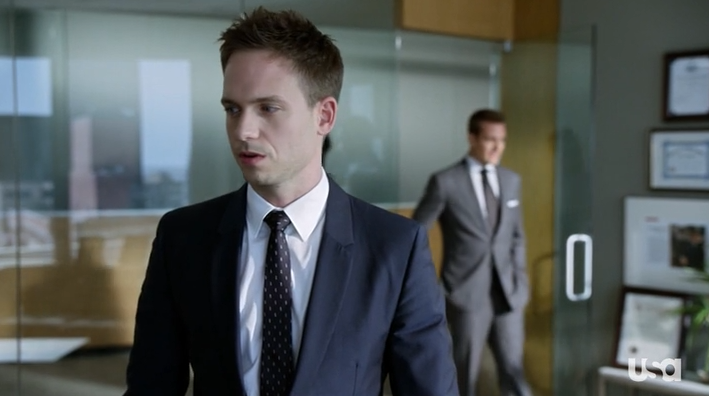 Nick is confused about his testimony, even though Harvey found a weak point in Nick, he couldn’t get the knockout win. It’s still works out because the case isn’t going to trial. Jessica and Harvey discuss different outcomes of the case, Harvey likes to win and he’s upset he didn’t get the win he wanted. It looks like that’s all we’ll get to see of Catelyn Stark. In the aftermath of Louis losing his associates, Jessica finds it in her heart to let Louis finally have one associate to himself. We already know who his first pick is…and Louis immediately gets to work to dig deeper into the ‘breakup’ of Harvey and Mike. Comparing them to the Prom King and his Boy Wonder, Louis asks Donna if they actually broke up, or having a time out. Donna tells Louis to ask Harvey himself, Louis begs her to ask him…but it’ll be more entertaining for Donna if she gets to see Louis beg Harvey. Harvey doesn’t put up a fight, mostly because he knows Mike will say no to Louis. Louis is eager to have Mike on his team so he bribes Mike with a case that will be ground breaking if they win. Mike can’t resist, Louis promises a victorious outcome and the two start working together. Louis takes Mike to his favourite steakhouse…and then a quick dip in a clay bath…but when Mike puts the pieces together to solve their case…Louis makes an abrupt decision. One that probably leaves Mike scarred for life. Back at the office, there is more drama that takes place in the women’s bathroom. After Rachel finds out that Harvey told Mike not to see Rachel (back when she didn’t know about his lie)…she’s absolutely devastated that Harvey would even think of her in that situation. 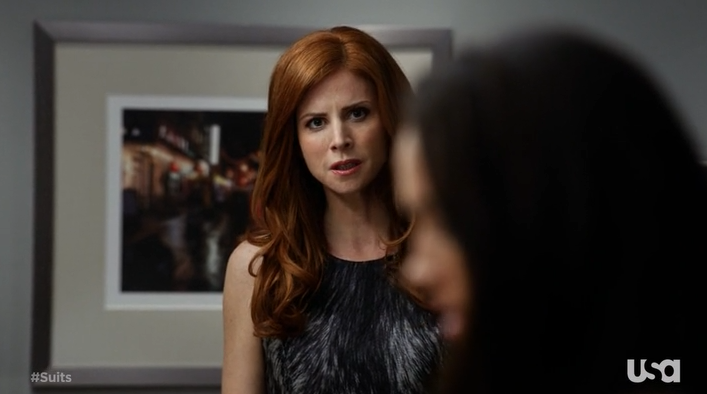 What she’s more pissed about is that Donna knew the entire time and didn’t tell her. Donna walks in on Rachel in the bathroom…not that she wasn in the bathroom doing business…she was just in the bathroom fixing her makeup. Anyways, Donna storms in and Rachel breaks out in tears. She tells Donna she thought they were friends, she thought she could trust her. 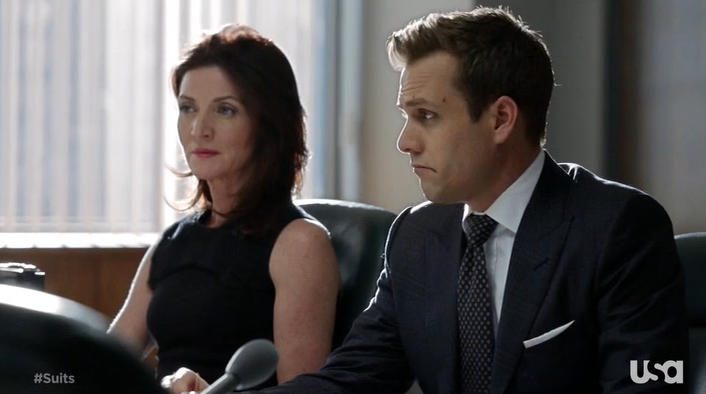 Donna explains that this is still her job and she still needs to protect Harvey. Rachel throws back an insult…insinuating Donna’s devotion to Harvey, and all Donna says…’Rachel, I’m going to leave before this gets any worse’. And before Rachel can say anything Donna storms out of the bathroom. Nice! In the end, Mike and Louis win their lawsuit. Louis is so happy, Mike visits him in his office to discuss their relationship. It’s important here to note, Mike visits Harvey a few times throughout the episode…and the last time, Harvey tells Mike they are done for good. So he can go ahead and do whatever he wants with Louis, because there’s nothing left between the two. I swear it sounded like a boyfriend/boyfriend breakup! Anyways, Mike agrees to team up with Louis. Louis is so happy he runs off to get something from the kitchen. And then this happens. After Donna tells Harvey to finally get over the Mike situation, and that Mike’s really not the one to blame, Harvey magically forgives Mike and all is right in the world. Harvey tells Mike he needs to come back to where he belongs, with him and Donna. Mike flashes a small smile, Harvey forgives him and they end their feud with a high five. The only thing is, Louis sees the entire thing, and it is so heartbreaking! Waaah! I feel so bad for Louis, just when he thought he had a best friend in Mike. We’ll have to see what happens next week!